Lewisham’s not had much luck with restaurants. 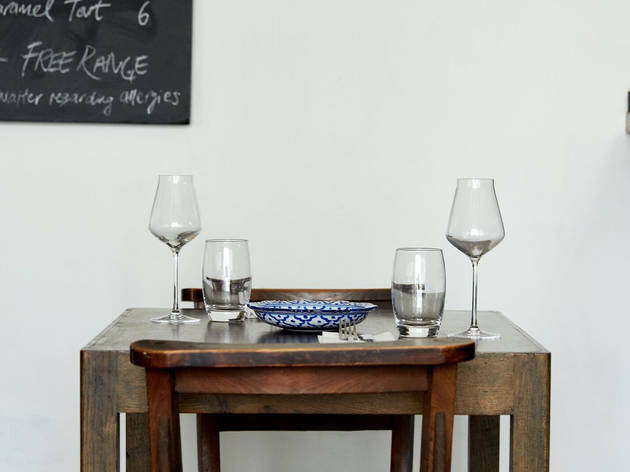 Its near neighbours – hipper corners of the borough such as Brockley and Deptford – are flush with great spots. But SE13 itself? Not quite. Praise be for Sparrow, then. 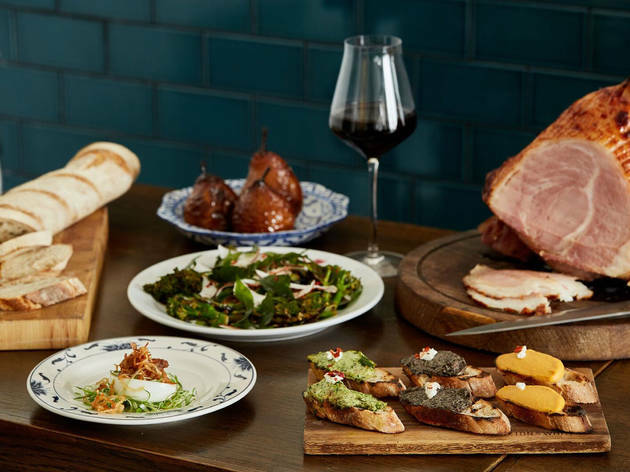 It’s founded by husband-and-wife team Terry Blake and Yohini Nandakumar who, between them, have experience at Bao, Pollen Street Social, St John and The Square (diverse, eh?). 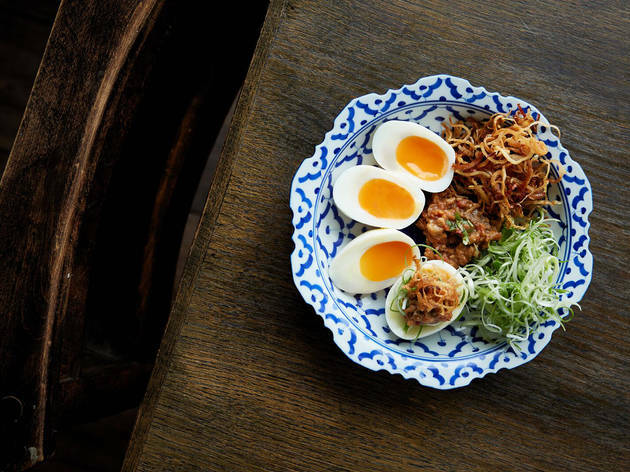 Here, their focus is on small plates that draw as much on British and European flavours as they do fragrant Central and Southeast Asian ones. They are almost all exceptionally good. The space itself is subtly lovely. Ceilings are fairly high, lighting is fairly low. There are washes of attractive deep-blue tiling. The evening’s wine bottles sit in an ice bucket on a tiny table by the bar. 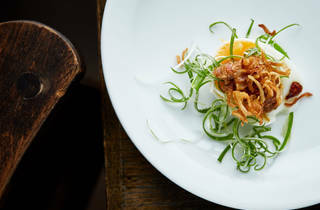 A board of chalked-up specials hangs over the bustling, unshowy open kitchen where chefs tinker, and there are printed spreadsheets on the wall. What’s outside may be a bit grim – three lanes of traffic – but inside things are rustic, makeshift and brimming with atmos. Bravo. On to the food: picking highlights is impossible, but I’ll try. Malt duck was a few slices of perfect pink breast meat piled under a confit leg. Fat-filled and papery when crisp, duck skin is – inarguably – the king of skins; this example was so good I’d have happily worn a dress of it, ‘Silence of the Lambs’ style, if it had meant getting a bigger portion. 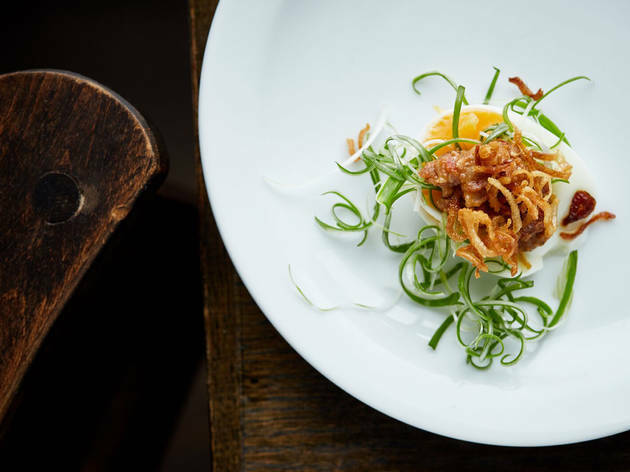 A DIY assemblage of vividly orange soft-boiled eggs, piled with a pork and anchovy relish and sliced spring onions, meanwhile, was astounding. We high-fived over the table between mouthfuls, decorum be damned. You’d do the same. Green risotto, humming with herbs and alliums – mostly parsley and late wild garlic, I think – was as beautiful to look at as it tasted: verdant, warming, given a sour note with a dollop of goat’s curd and a bit of crunch with toasted hazelnuts. Finally, there was a bowl of nutty beef massaman curry, with scorched sticky rice, played straight. Sticking an unembellished curry dish into a menu as varied as this one could have been an audacious mistake. This was as good as any I’ve eaten while schlepping through the Thai countryside. I’ve just one criticism. When a Persian rug-maker creates a carpet they always include a flaw, so as to avoid fashioning something perfect and insulting Allah; in Sparrow’s case, this deliberate gaffe must have been the coffee, which was rubbish. Not that it stopped me wolfing down a condensed-milk affogato, the ice cream itself dense and crumbly like an Indian kulfi. A foodie renaissance in SE13? I’m not holding my breath for that just yet. But regardless, Sparrow is a high-flying success. A hidden gem in the heart of lewisham! There’s nothing bad to say about this place, the food was AMAZING (shout out to the pork belly and the beef curry), wine list was great and the general ambience was relaxed and trendy. Such a great place to catch up with friends on a Saturday evening and not spend a bomb. Definitely recommend but make sure you book. I was blown away by Sparrow. On the middle of a roundabout on a busy road, I wasn't quite sure what to expect. The staff were welcoming and attentive. 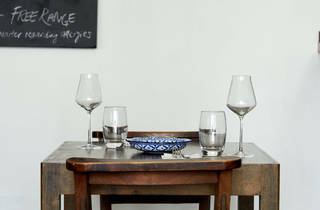 The restaurant feels intimate and laid back which made our meal very relaxing. 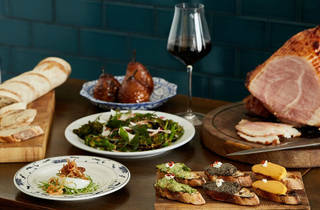 The table ordered an array of small plates and shared. The most obscure sounding dishes were often the best - from beetroot risotto to massaman beef cheek curry. Every dish offered something unique and nothing could be stapled 'ordinary'. A must visit local gem for Lewisham, worth the travel to visit. Buoyed by the prospect of top chefs delivering delights just off Lewisham station a group of us headed down to Sparrow to try out their brunch offering. The restaurant itself is light and breezy, with a cracking selection of top shelf liquors decorating the shelves and large tables suited perfectly for sharing. I went for the eggs benedict which was firmly on the British side to the fusion and contemporary dishes. It was good, not the greatest I've ever had (that honour still goes to Hash E8) but everything was well cooked and flavourful. The bloody mary's weren't as successful, they went heavy on the mustard much to my dismay, though they were nice and spicy and allowed us to vary the spiciness by however much we fancied. Service was brisk but pleasant enough and the prices, while on the high end, felt within the value for money range. All in all Sparrow is definitely worth a visit, especially for the area. I'd be very keen on returning for dinner, as what was an above average brunch could easily be an incredible dinner offering judging by the menu and skill in cooking. This elegant restaurant seems slightly out of place, attached to the outside of Lewisham Shopping Mall but I love that it has such a quirky location and brings a whole new vibe to the area. The decor of Sparrow is minimal, crisp and ordered- immediately giving you the impression that perfection is key to the running of the space. The menu has ever changing seasonal ingredients, some dishes inspired by Sri Lanka while others based on great British grub however with a modern flair. This is a unique restaurant I suggest sampling for dinner in the weekdays or brunch in the weekend. Don't be caught out with Sparrow's opening times, always check ahead as they differ from your usual. Staff are very friendly and informative as they carefully discuss what the menu entails and process of cooking. I enjoyed hearing about the food I was choosing and how it was to be prepared. Gold stars for effort and taste! Sparrow sits on the corner of the large and busy Lewisham roundabout and is a safe haven from the blaring horns and exhaust smog. Once inside you are welcomed into a modest and calm space with tall white walls and minimalist lighting. Our waiter explained the basic yet intriguing menu and informed us that each meal was created to be shared; like tapas. We started off with the courgette bruschetta which was petite but moreish (and we eventually ordered seconds) whilst I sipped on their apero of the day. 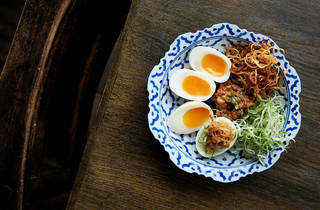 Then the feast commenced; boiled eggs with pork and anchovy relish was light but wholesome, beef massaman curry which was just the right amount with sweet. The sliced duck was cooked to perfection and the green risotto was full of so much flavour. The service was second to none, with the bar tender even coming to our table to check that I liked my drink and you could tell there was family feel to the restaurant with the buzz amongst the staff. Lewisham has a new diamond in the rough, and I'm excited for the potential that this town now has.